Description - Our Designer Grip-Loc tiles provide a durable and beautiful surface for areas where water is present. 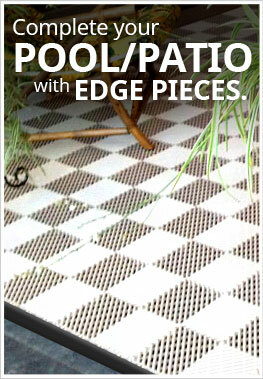 The tile’s latticed design creates a unique and fun flooring surface for your bathroom, locker room, or laundry room. With this unique pattern, these tiles have also been used in indoor patios and sunrooms to create a dry and clean flooring surface. The tiles also create a slip-resistant surface that is comfortable to the touch and free draining. These tiles are capable of handling extremely wet and uneven surfaces and are resistant to bacteria, fungus, mold, and mildew among many other hazardous substances. Since these tiles are made from EVA, they are stain resistant, and odorless. Installation is as easy as snapping together adjacent tiles to form a beautiful and customizable flooring surface. Designer Grip-Loc tiles also come with an industry leading 10-year warranty. Material - Constructed of high quality EVA (Ethylene-vinyl Acetate). Recommended Uses - Designer Grip-Loc tiles are truly built to be a multi-use durable floor tile. 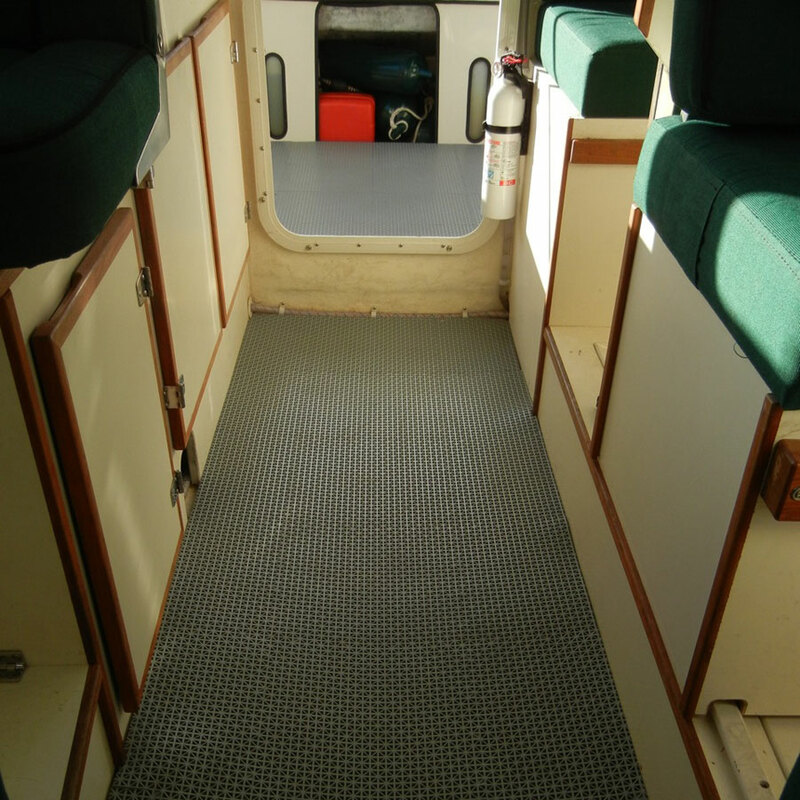 These tiles are most commonly used as locker room shower matting however they have also been used successfully as a flooring option in boats, as decking tiles, in laundry rooms, kennels, and workstations. They also have been successfully used as shelf liners for bars and workshops. Vacuuming any loose dirt, dust, or debris from the tiles. What is used to cut them for a custom fit? You can cut our Designer Grip-Loc Tiles easily with a sharp utility knife and a straight edge. Do these tiles have to be put over a concrete base? I am thinking of using under a hot tub. The soil is firm with gravel. You can install our Designer Grip-Loc Tiles over crushed gravel under a hot tub. We typically recommend installing these tiles over concrete or asphalt, but any hard flat surface also works. If there is a major flooding event, these tiles may become unstable and may float away, but under normal conditions, these tiles will perform just fine. we want to put these tiles over a flat roof but want to make sure the will not penetrate roof and cause leaks. will this work for that purpose? Our Designer Grip-Loc Tiles are made from EVA and are a very flexible plastic that will not puncture your roof. These tiles will work as flooring on a roof. Since these tiles are not UV stable, these tiles will fade in direct sunlight. Also, there may be some expansion and contraction with these tiles, so you will want to leave an expansion gap around the flooring surface. These tiles will allow water to flow freely through the flooring system making them slip resistant when wet and they are mold and mildew resistant. Designer grip-loc tiles, are they soft or hard plastic? Our Designer Grip-Loc Tiles are a soft plastic flooring. 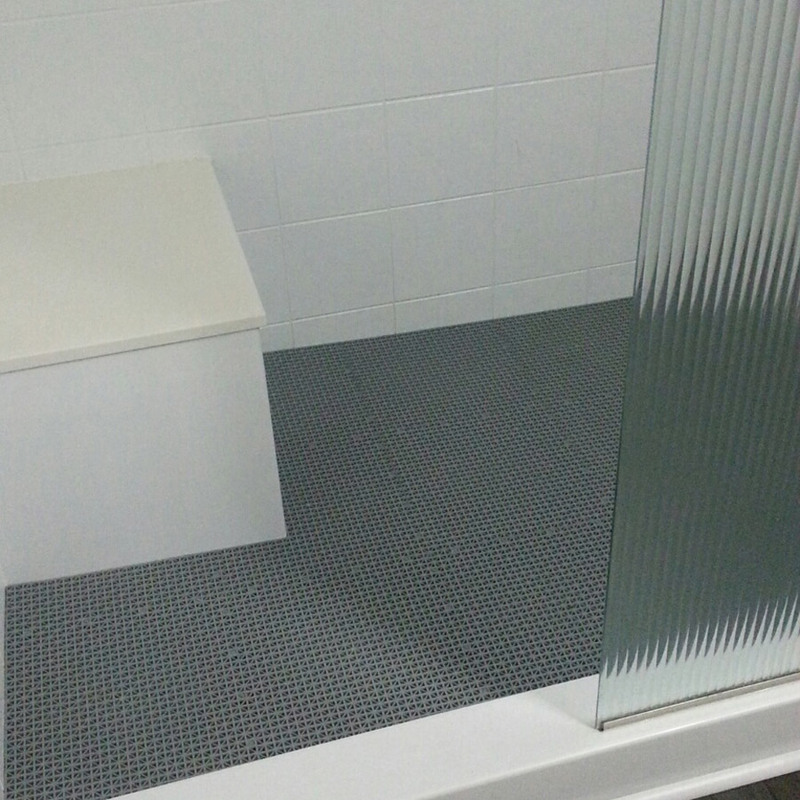 These tiles are great a shower flooring because they are comfortable underfoot and slip resistant when wet. These tiles are very easy to install and clean and are mold and mildew resistant. Can these tiles be used in a sauna? Our Designer Grip-Loc Tiles can be used as flooring in a sauna. These tiles were meant to be used as flooring in areas where water will be present and are softer than our hard plastic tiles. They are still very durable but are meant to be comfortable under bare feet. These tiles will not melt due to the heat in the sauna as they are made from the same material as many household items and piping. We used these tiles to line the shower floor of our trailer/RV. They work perfectly, exactly what I wanted. I used a pair of scissors to trim them to fit around all the nooks and corners. Once I figured out how to snap them together it was a "snap" to do. The only reason they didn't get all 5 stars is because of the limited color selection. I really wanted either a pure white or bright apple red. But otherwise, product is great. We purchased these tiles for the mud room entry of our home to go over the concrete floor. These tiles met or exceeded all of our expectations. The only hang-up we had was that they were fairly difficult to snap together in place, especially in when you have to join up two sides at once. The locking nubs are pretty stiff to snap in place with your hands. We tried a few different methods and actually discovered that a hammer worked really well for the job. We basically would get the male and the female parts of the locking nubs lined up pretty close, all on the floor, then take a hammer and lightly pound them together. Made the job really easy actually. Other than that, the tiles are an awesome value and I highly recommend. Installed Designer Grip-Loc Tiles in our open shower to reduce slip danger and improve overall appearance. Fairly easy to install and cut to size using utility knife. Wife was very happy and loves the shower which is great, but now I have to share my shower. Will be a great advantage when my physically impaired Mother visits.